Tom Denton rescued a point late on as Chesterfield’s sorry run continued with a 1-1 draw at FC Halifax Town. 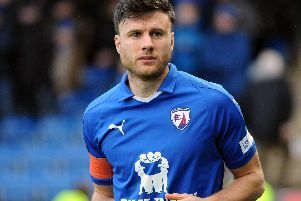 The struggling Spireites have now gone 13 games without a win with Denton cancelling out Matty Kosylo’s opener. Martin Allen’s side did have the better of the opening exchanges. Halifax strugged to come to terms with Sam Muggleton’s long throw early on, which Chesterfield nearly profited from in the opening minute only to see Will Evans’ shot blocked from close range. The opening half took a while to get going with the Shaymen just edging it. Jonathan Edwards proved tricky to handle, supplying a couple of inviting crosses across the face of Chesterfield’s goal. Indeed, it was another Edwards’ run which resulted in FC Halifax earning a corner, that found its way to Joe Skarz who cracked it from all of 20 yards only to see it whistle past the post. Goals for Chesterfield have been at a premium recently, only three since the middle of August and it was easy to see why. The Spireites’ best effort came in the 35th-minute, yet another Muggleton long throw was turned goal-ward by the towering Denton but the ball didn’t dip in time, striking the top of the cross bar. It appeared the game was taking a familiar path as FC Halifax broke down their right hand-side, Kosylo latching on to a through ball, leaving him just to touch it round Callum Burton and slot home give them a 70th-minute lead. The Spireites were level 10 minutes later, Hines, who looked a threat since coming on at halftime, crossed in for Denton to guide his header into the corner of the net. FC Halifax could’ve nicked it in stoppage time but Kyle Wootton’s header crashed down off the crossbar. The draw, Chesterfield’s third in a row, leaves them teetering three points above the bottom four in the National League. FC Halifax Town: Johnson, Clarke, Staunton, Kosylo, Southwell (Duckworth 77), Edwards, Berrett (King 59), Maher (Lenighan 44), Wootton, Skarz, Hanson. Unused subs: Rowley, Odelusi. Chesterfield: Burton, Denton, Shaw (Fortune 90), Rowley, Muggleton, Weston, Smith, Evans, Reid (Binnom-Williams 66), Maguire, Kiwomya (Hines 45). Unused subs: Hollis, Kayode.